Saturday December 6th was the National Day of Remembrance and Action on Violence Against Women in Canada. 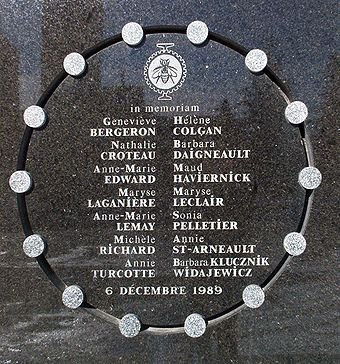 On that day in 1989 fourteen young women were massacred at the l'École Polytechnique in Montréal. The murderer, Marc Lépine, entered a classroom where a mechanical engineering class was in progress and separated the male and female students at gunpoint. After ordering the men to leave, he reported told the women "I am fighting feminism." One of the students, Nathalie Provost, said, "Look, we are just women studying engineering, not necessarily feminists ready to march on the streets to shout we are against men, just students intent on leading a normal life." Lépine responded that "You're women, you're going to be engineers. You're all a bunch of feminists. I hate feminists." Lepine opened fire, killing six women and wounding three others. He then continued shooting as he walked through the building, leaving 14 dead and 14 wounded. Geneviève Bergeron (born 1968), civil engineering student. Hélène Colgan (born 1966), mechanical engineering student. Nathalie Croteau (born 1966), mechanical engineering student. Barbara Daigneault (born 1967), mechanical engineering student. Anne-Marie Edward (born 1968), chemical engineering student. Maud Haviernick (born 1960), materials engineering student. Maryse Laganière (born 1964), budget clerk in the École Polytechnique's finance department. Maryse Leclair (born 1966), materials engineering student. Anne-Marie Lemay (born 1967), mechanical engineering student. Sonia Pelletier (born 1961), mechanical engineering student. Michèle Richard (born 1968), materials engineering student. Annie St-Arneault (born 1966), mechanical engineering student. Annie Turcotte (born 1969), materials engineering student. Barbara Klucznik-Widajewicz (born 1958), nursing student. If they had lived, they would have been about my age. Perhaps today they would be successful engineers. Perhaps they would have been married once or even twice. Perhaps they would have had children. Perhaps none of those things. Their lives were cut short long before they could finish living them. Image: Plaque commemorating the victims of the massacre at École Polytechnique.